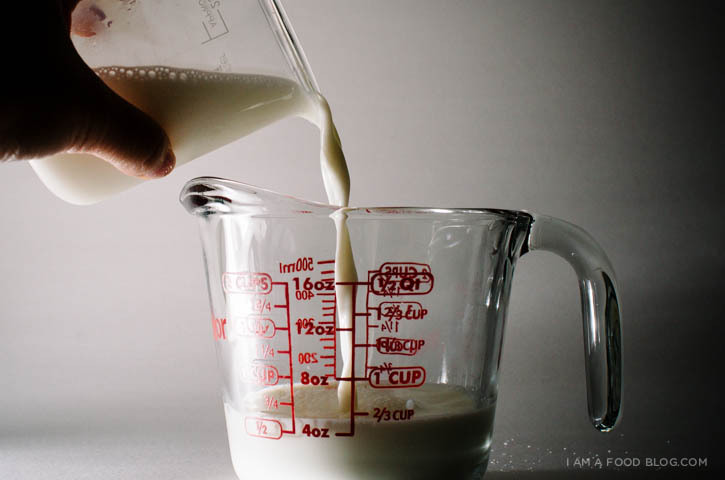 Mix together the milk and sugar in a small, heavy-bottomed sauce pan. Over medium heat, warm until just steaming. Lower the heat and simmer for 2 hours, or until it thickens slightly. 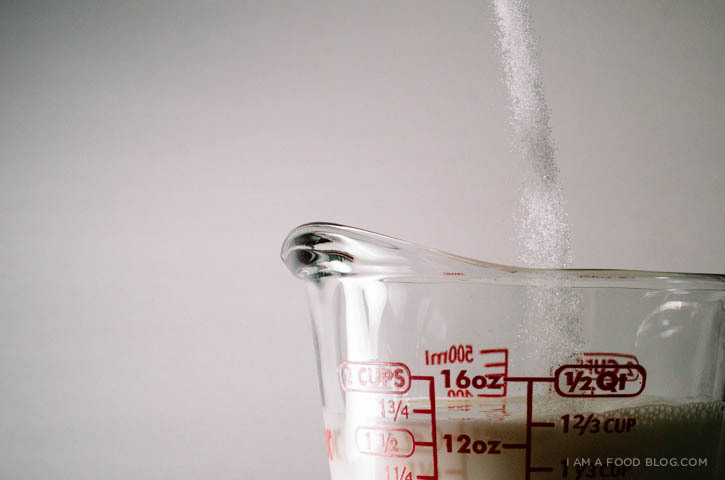 When the mixture has reduced by about half, stir in the vanilla extract (if using). Pour into a clean, dry airtight container (I like to use a glass jar) and cool completely. 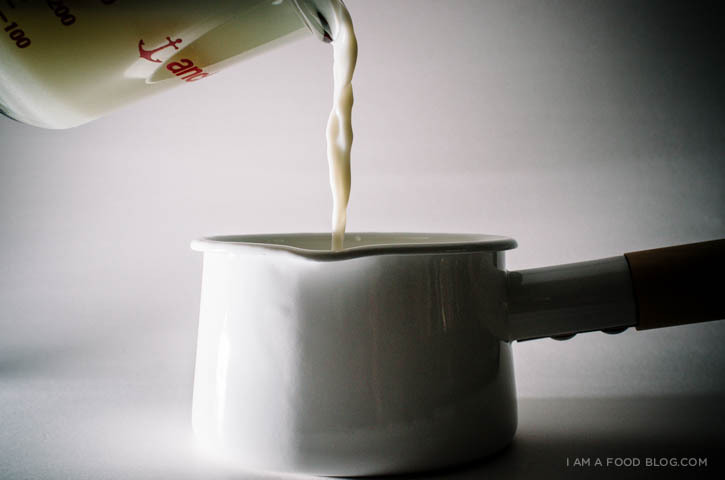 The milk will thicken slightly in the fridge. Store in the fridge for up to 2 weeks. Notes: This won’t be nearly as thick as canned sweetened condensed milk, but it does have the same sweet, milky flavour. Note: The vanilla is optional – it adds an extra hint of creaminess, but isn’t absolutely necessary. 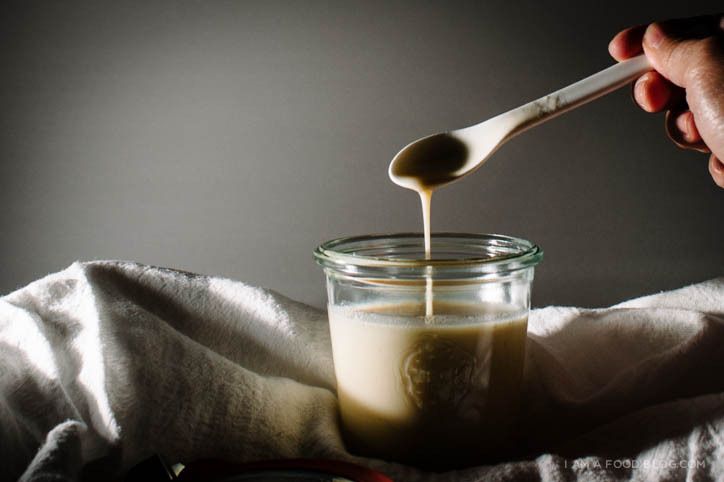 Also, Erika of The Pancake Princess has successfully made vegan condensed milk using coconut milk! Check it out! PS – My cookbook, Easy Gourmet, is available for preorder now! Run & get your copy before they’re out! Aww thanks for the link Stephanie! 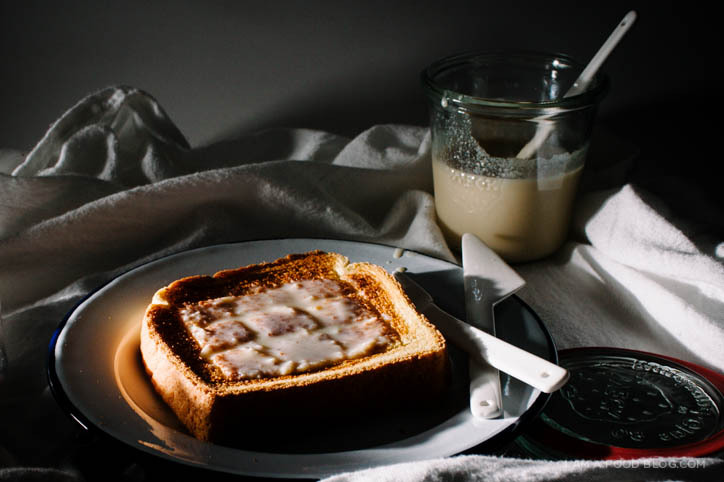 Your photos are GORGEOUS as always–that glistening layer of condensed milk on that fat piece of toast looks TO DIE FOR. LOL I’ve never quite had a 3am coffee craving since I don’t usually drink coffee…but chalk up my vices to cake and teeny bopper TV shows. Because late night cake cravings are DEFINITELY a thing. MMM CAKE! oh oh yes, who doesn’t love teeny bopper TV shows!??! SURVIVOR?! do they still make new episodes of that show?! these photos are so stunning. 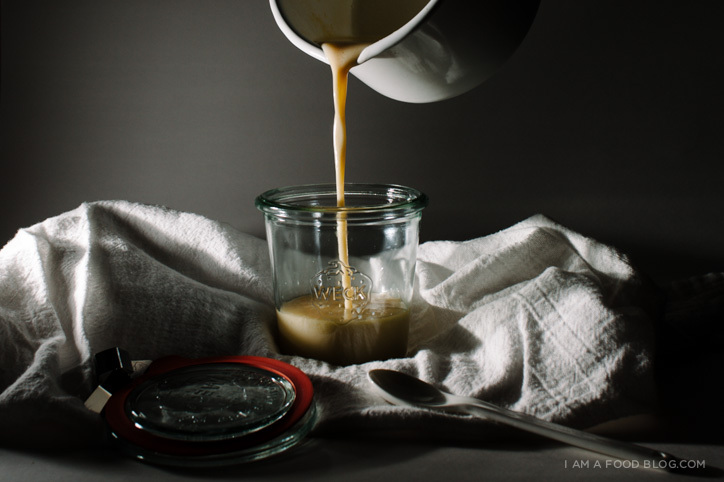 i am so in awe of your ability to take a simple thing like condensed milk and make wowee zowee beautiful photos out of it. i also must get my hands on some of that yummy soft bread. THEY DO! hahhaha although, i confess, i only got addicted because my friend was binge watching one night…i didn’t know they made new episodes either but apparently they are on their 20 millionth season or something. girl, you can make that bread! you have da bread skillz. 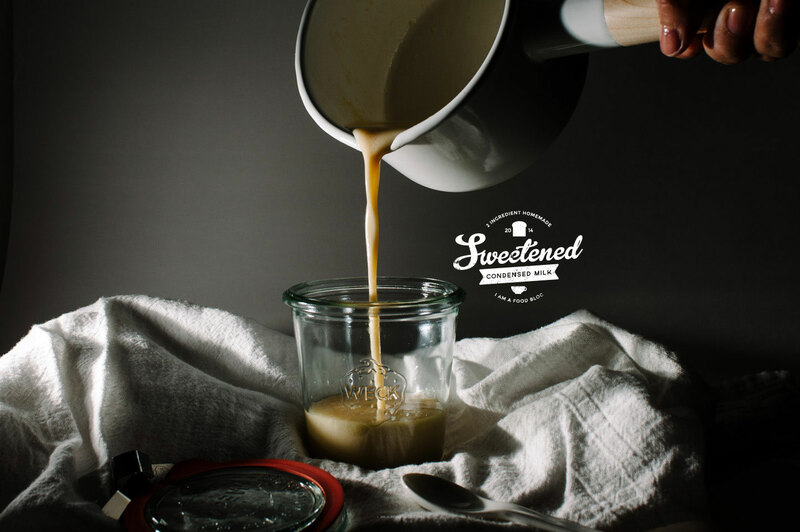 You can make sweetened condensed milk at home? MIND blown. I had no idea. I wonder if it would work with almond milk too? I have so many things I want to try out now. Thank you for kind of changing my life a little bit. hmm, don’t know if almond milk would get as thick, but it would definitely taste good. mmm….almond condensed milk toast topped with chopped roasted almonds…or almond butter..gah. so delicious! YUM. Also, am very impressed by your dedication to sweetened condensed milk AND trashy TV, lol. I love that you made this at 3AM. Rock it, lady. when it comes to sugar and tv i can be VERY dedicated! As if you freaking made your own!!! I love condensed milk too!! oooooooh this stuff is SO dangerous! This may put Michael Polan’s “you can eat anything as long as you make it at home” idea right out the window. SO trying this! I love eating sweetened condensed milk with plain, fried Chinese steamed bread. Sooooo good! Brings back so many good memories. Thanks for the recipe! Your pictures look wonderful! This look like an amazing recipe, I wonder if you could sweeten it with a little chocolate? as always, thanks for posting on this wonderful blog. I haven’t tried sweetening with chocolate, but that sounds both wonderful and doable! Awesome recipe! I tried it yesterday with brown sugar, everything in the same quantities. It’s until that I cooked 15 mn too much (on low temperature : 1,5 and max is 6) :( I should have stopped at 1h30 instead of 1h45, there was lumps everywhere :( It still tastes good but the feeling is quiet different! This! This is what I want when I wake up in the morning.